The ezTalks Rooms is a conference room solution, which can be used to host/join audio and video meetings or host/join webinars. A Windows computer installed with ezTalks Rooms software. Download here. A PC or mobile installed with ezTalks app. Download here. 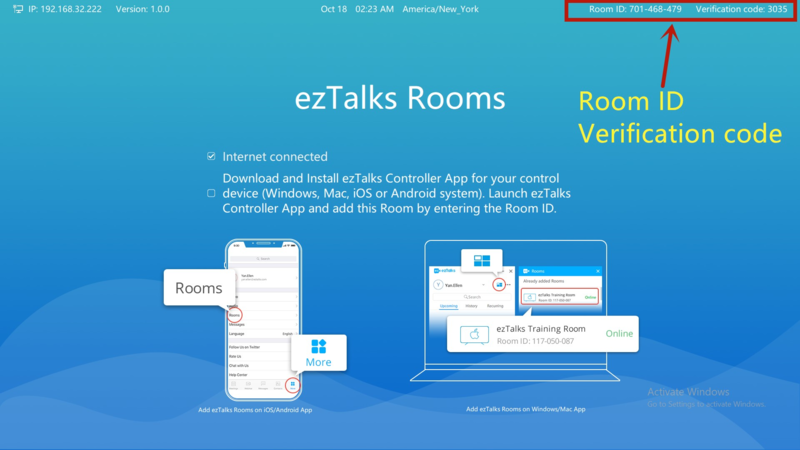 It requires to install the ezTalks Rooms software on a Windows PC in your conference room first, and install the ezTalks app on another PC or mobile device to control the room. Additional equipment can include TV displays, speakers, cameras, microphones for more than one people to host/attend meetings in a conference room. On the Rooms page, you can see the Room ID and Verification Code, which will be used on the ezTalks app. You can use a Windows/Mac PC or an iOS/Android device to install the ezTalks app. For mobile app, go to More--> Rooms to add a room. You can start a video or audio meeting on the app through the room that has been added. 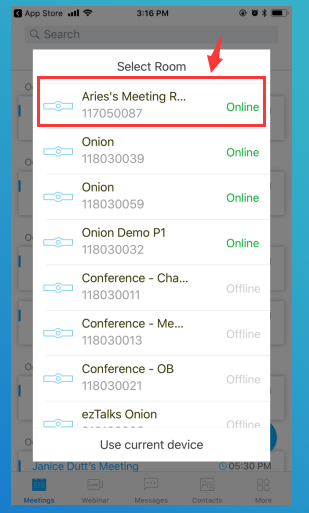 In the meeting, you can easily switch to current device to have the meeting or switch back to Rooms. 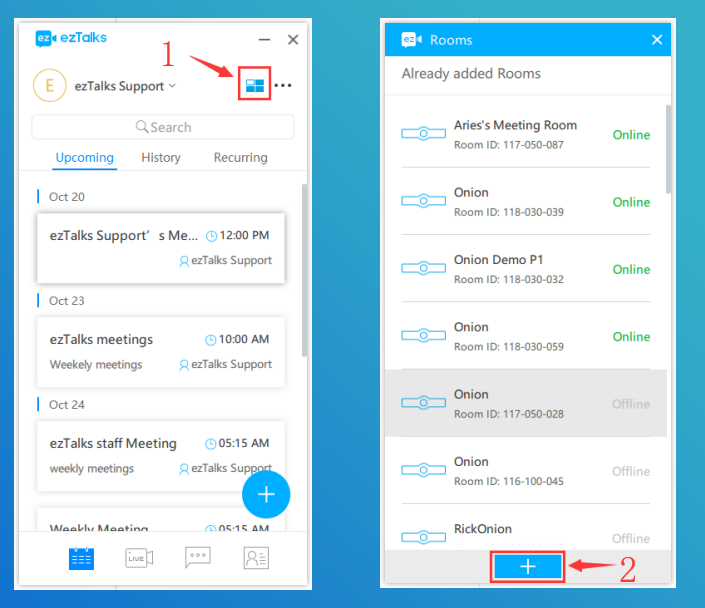 Once the host starts a meeting with ezTalks Rooms, the attendees can join the meeting from another ezTalks Room, or directly from the ezTalks PC/mobile app. 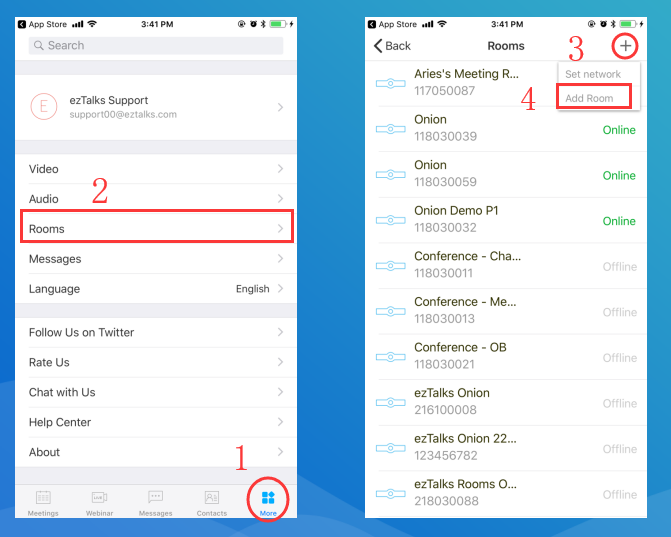 For how to join a meeting directly from the ezTalks PC/mobile app, please learn how to join a meeting.